A team of engineering students whose high-flying weather balloon plunged into the Pacific Ocean this spring got a crucial assist from engineers at SanDisk Corporation, who salvaged valuable data from flash memory cards that had spent days immersed in saltwater. As a result, the students completed a highly successful senior project, and the astronomical observatories that sponsored the project now have information that will help them focus more clearly on the stars. This remarkable chain of events began when the students, all seniors in engineering at UCSC, released a helium-filled balloon with instruments that included atmosphere probes, a transmitter, a digital camera, and a custom-built data recorder. Both the camera and the recorder used SanDisk SD™ flash memory cards to capture images and continuous telemetry readings. 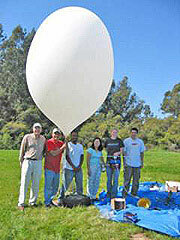 Calling themselves Team BAT (for Balloon Atmospheric Telemetry), the students launched their balloon in early March from a softball field in Watsonville. Their intent was for it to rise 75,000 feet and continually record information on turbulence, including temperature, humidity, pressure, altitude, longitude, and latitude. These are parameters that enable astronomers to measure light refraction from the atmosphere and adjust their telescopes for the clearest image. With a GPS device giving the balloon's position, the students were able to track its flight path for about two hours. They were expecting it to reach maximum elevation before deploying a parachute and settling gently back to Earth. But things suddenly went haywire. A burst of wind pushed the balloon and its payload of electronics over the ocean, where it ultimately ruptured and splashed into the waves about two miles offshore from Pajaro Dunes, presumably never to be seen again. Team BAT was ready to scratch the mission as a failure after gleaning only erratic bits of data from the transmitter. But fortune prevailed. Five days after the balloon disappeared, a beachgoer found the apparatus washed ashore about 20 miles north of where it had dropped into the ocean, and called the university. When the students arrived, they saw that the small padded lunch bag containing the circuit board for the telemetry equipment--and a SanDisk 1-gigabyte (GB) standard SD memory card--were thoroughly soaked by saltwater. 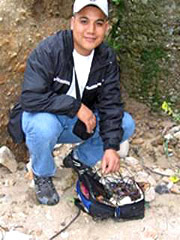 Nearby were the shattered remains of the digital camera, which had been separated from the bag. Amazingly, the memory card, a SanDisk 128-megabyte (MB) standard SD card, was among the rubble. Back at their UCSC lab, the excited students dried out the card from the camera, slipped it into a card reader on a PC, and observed a string of breathtaking, high-elevation photos, the last one shot at 40,000 feet. Not a single image was lost. But the SanDisk SD card from the data recording device was completely unreadable. So Dave Van Unen, engineering lab staff for UCSC's Jack Baskin School of Engineering, sent the card to SanDisk as a last resort. After a week of repeatedly scanning the card with a special reading device and getting intermittent errors, Ysabel Tran, a technician in SanDisk's engineering lab, was finally able to extract all of the data on the card. She transferred it to another SD card, which was immediately relayed to Team BAT. UCSC engineering student Roberto Menchaca said that although his group estimated a peak altitude of 60,000 feet for the balloon, in fact the card data recovered by SanDisk showed a maximum of 81,863 feet--far above the original objective. And while the balloon transmitter radioed just 1,028 samples of data, the card yielded a whopping 53,406 samples. "This gave us more accurate data and, just as important, it was continuous, whereas the data we received by radio was full of gaps," he said. Elated at their now successful project, the students presented their report to the observatories. Members of the team, apart from Menchaca, consisted of project leader Skye Vendt-Pearce, Bartolo Alvarado, Amanuel Mengistu, and Kathy Phan. When graduation ceremonies were held in early June, Alvarado received both the Dean's Award and the Chancellor's Award--a rare double honor--and Mengistu received the Dean's Award. "We're delighted that we were able to assist these aspiring engineers and thus contribute to the space program," said Nelson Chan, SanDisk's executive vice president and general manager for consumer and handset business. "This amazing series of events once again demonstrate the durability of SanDisk's flash memory cards." John Vesecky, professor of electrical engineering and the faculty mentor of the student team, said the overall project was commissioned by UC's Lick Observatory and the Palomar Observatory in southern California and funded by Cal Space, a state grant program that promotes space-related education within the university system. "The students were measuring variations in atmospheric turbulence--essentially wind shear," said Vesecky. "These are little fluctuations in air temperature that occur in sizes of from 10 centimeters to a few hundred meters. They are like eddies in the atmosphere and they create distortion--the 'twinkling' in the stars that people see from Earth--and generate fuzzy images for telescopes. It's like looking at lights through a swimming pool." By using the student balloon data, land-based astronomers can begin to profile the layers of turbulence and improve their ability to compensate for them using a process called adaptive optics. UCSC is a leader in the field of adaptive optics, with a major Laboratory for Adaptive Optics as well as the headquarters of the national Center for Adaptive Optics both located on campus. Another student balloon was launched in June and a third may be released this fall, said Vesecky. SanDisk is the original inventor of flash storage cards and is the world's largest supplier of flash data storage card products, using its patented, high-density flash memory and controller technology. SanDisk is headquartered in Sunnyvale, CA, and has operations worldwide, with more than half of its sales outside the U.S.